Laptops and tablets seem to get most of the attention these days--after all, they’re great for working on the run. But once you settle down at your desk, it’s nice to stretch out with the generous real estate that only a widescreen monitor can provide. And now is the perfect time to buy a monitor: They're cheaper, thinner, and less power-hungry than ever before. To take the pulse of the current LCD-monitor market, we rounded up nine 23- and 24-inch displays from six manufacturers, at prices ranging from just $160 to $425. The differences between monitors used to be obvious right on the screen. 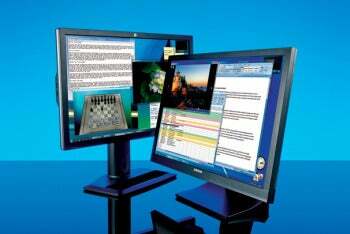 But as the quality of LCD panels has become universally impressive, the differentiators among monitors have grown more subtle. As you shop for a display, you should keep in mind several factors: the type of backlight a monitor uses, the ergonomic adjustments available, the number and types of inputs the display accepts, and the aspect ratio. Backlight type: For years, LCD monitors used cold cathode fluorescent lamps to illuminate their panels. Though CCFLs work well, they require more energy, take longer to warm up, generate more heat, and occupy more space than the LED backlights in most current monitors do. Of the nine displays we reviewed for this roundup, just one, the Samsung E2420L, uses CCFL backlighting; not surprisingly, this non-LED model is also the least expensive unit here, at $160. 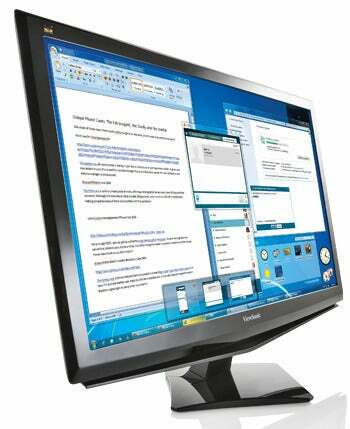 Ergonomics: Some relatively affordable displays permit few ergonomic adjustments, generally limiting you to tilting the screen backward or forward only a few degrees. Others, like the HP ZR2440w, the Samsung S24A450bw, and the Dell U2412M, are as flexible as a yoga instructor, allowing you to raise or lower them, tilt them back or forward, swivel them left or right, and rotate them into portrait orientation. Without such flexibility in a monitor, you might need risers, a different chair, or a whole new desk to put the display in the proper viewing position. Inputs: All of the displays we reviewed have at least two types of inputs--one analog (VGA) and one digital (DVI). An analog input is helpful if you have a really old PC, but most modern computers use DVI or another digital connection. Just three of the nine displays in this group include HDMI connectors, which are present on many consumer electronics devices, such as TVs and game consoles. Only two of the monitors we tested feature DisplayPort, a connection most often included on Apple products. Aspect ratio: The monitors in this roundup fall into two categories, 16:9 and 16:10 widescreen. The 16:9 displays have a resolution of 1920 by 1080 pixels, while the 16:10 displays all provide 1920-by-1200-pixel resolution. The 16:9 displays are well suited to playing widescreen, high-definition content, as their 1080-pixel vertical resolution matches the resolution and dimensions of 1080p HD. The 16:10 displays have more vertical pixels, so HD material still fits just fine, albeit with black bars on the top and bottom. Those extra pixels can be helpful in situations where you’re looking at a number of windows simultaneously. In the market for a new LCD monitor? Check out our Top 23- and 24-Inch Monitors chart, or click the links below to read our full reviews. At $425, the 24-inch HP ZR2440w is the most expensive monitor in this test group, but it’s also the most capable. It produces brilliant images, it’s easy to adjust, and it can connect to your other electronic devices in lots of ways. Samsung’s S24A450bw is a great bargain, if you can do without a few features. Despite its moderate price of $300, it landed near the top of the heap in our screen-quality tests. Dell’s U2412M offers screen quality that’s almost as good as that of the top-ranked HP ZR2440w, for a little less money. Plus, its design is flexible and efficient. The $349 ViewSonic VP2365 is a bit smaller (23 inches) and a little lower in resolution (1920 by 1080) than the three highest-ranked displays. Its physical appearance is unimpressive, too. But it did well in our tests of screen quality. In choosing to buy the $170 Asus VS247H-P, you won’t get quite the same great screen quality as you would with the higher-rated monitors in this roundup--but you certainly will save some money. Priced at just $160, Samsung’s E2420L is the least expensive monitor in our roundup. So what’s missing? Not screen performance--the E2420L scored reasonably well in our tests. 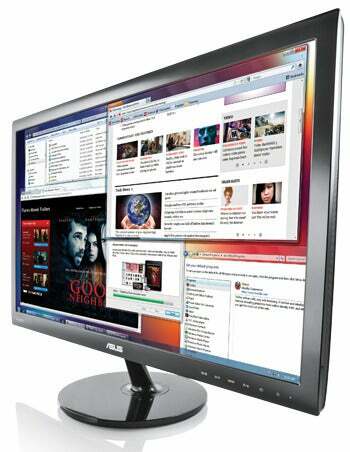 But it is bulkier and less versatile than other monitors we looked at. The glossy-screened x2301 ($249), with its dark gray bezel, aluminum trim, and green-tinted translucent base, is certainly out to make an impression. Unfortunately, this 23-inch monitor’s performance isn’t nearly as impressive as its design. The $209 ViewSonic VA2448m-LED performed decently in our screen-quality tests, but it’s not especially adjustable--and it has all the stability of a bobblehead doll. On paper, the $229 Acer S242HL looks like a bargain. But it doesn’t look quite as nice when it’s connected to a computer. The problem isn’t with its specs; what really sinks the S242HL is the quality of its display.